Take an epic journey to the Great City. 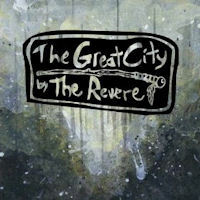 The Revere, the Warringtion, PA version not to be confused with the UK band Revere, released their first CD The Great City digitally on Amazon.com on January 18, 2010 for free. This first venture into commercially viable music is quite ambitious. For all intents and purposes, The Great City is a rock opera in the style of Trans Siberia Orchestra’s recent release Night Castle . The Great City is a journey by a group of people led by an old man. The journey seems to take place in a dream. The Revere open the story with “Sleep is a Celebration,” and Sean Kelly (vocals and guitar) pleads “beg me to sleep for this is my dream,” and then sets the stage for a preternatural journey. The journey starts at an inn where the travelers meet an old man who will lead them to the great city. Along the way they encounter beauty, terror, and even some giants. The journey is Tolkienesque and filled with fantasy. The story is very well told. The rock it rides on is solid and driving. It moves the story along, sometimes frenetically, and sets the mood for a great adventure. The driving guitar is powerful and engaging. The ballads are smooth and at times beautiful. Artistically this is solid, and it has what we call pace in theater. It moves and keeps moving naturally without any lulls to keep the listener entranced. I could not help but wonder though “why?” [I also could not help but think about Spinal Tap and their tiny Stonehenge] Why tell the story this way, and what is it really about? The answers to the questions are not mine. No matter how they are answered these questions pose the biggest challenge to The Revere and The Great City. This album requires that the listeners really listen. The Great City is a story, and the songs taken out of context my not engage someone unfamiliar with the band or the story. This is really good music, but an odd time in The Revere’s careers to introduce such an album. That’s what I meant when I said this offering is ambitious. Imagine if Ummagumma was Pink Floyd’s only album; they would only have a cult following. There’s absolutely nothing wrong with that. Perhaps by giving this album away, it will attract to The Revere their own cult, and they can thrive among those who really appreciate them. Its FREE! Pick up your own digital copy today! By the way, this is part one of the story. Just for fun, and while you’re here, why not visit Stonehenge with Spinal Tap?